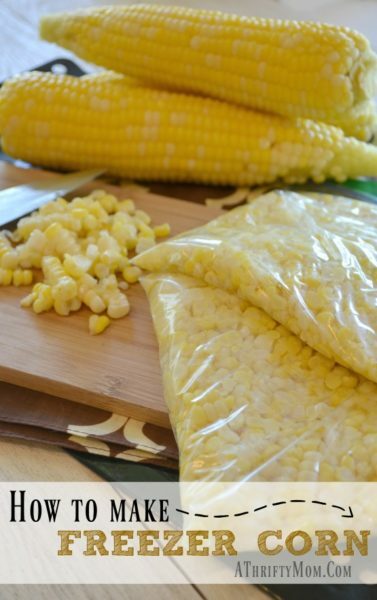 I had a friend ask me how to make Freezer Corn so I thought I would share this post again. As you can tell by the photos this post was written and first published several years back. Look how cute and little my kids are 🙂 But I did update it with some better images of the finished product, feel free to pin them! Growing up in large family, my Mom made sure we knew how to take our produce and can or freeze it. So I learned how to make freezer corn at a young age. In doing this we were able to save hundreds of dollars a year. 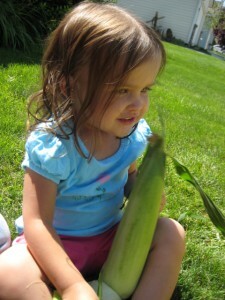 My Dad is a farmer, he normally grows corn that is called field corn, which grows VERY tall. It is grown to chop up, stalks and all to feed to our dairy cows. 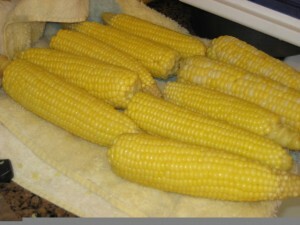 But my Dad also grows a few large rows of sweet corn, which my whole family looks forward to every year. 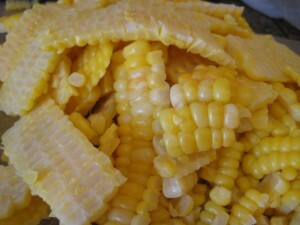 If you have ever had fresh tender sweet corn picked right from the field, it is so yummy. Nothing like what you buy from the store. 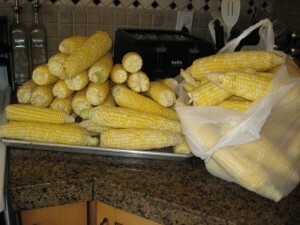 After about 30 mins we were able to bring the cleaned corn back into the house to get it ready to cook. 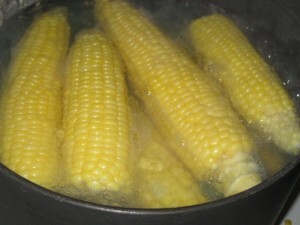 In a large pot bring you water up to a boil, then add in your corn. In my pot I was able to do about 10 at a time. The corn is cold so it will take a minutes for the water to start to boil again, after it comes back to a boil cook it for 3-5 minutes. 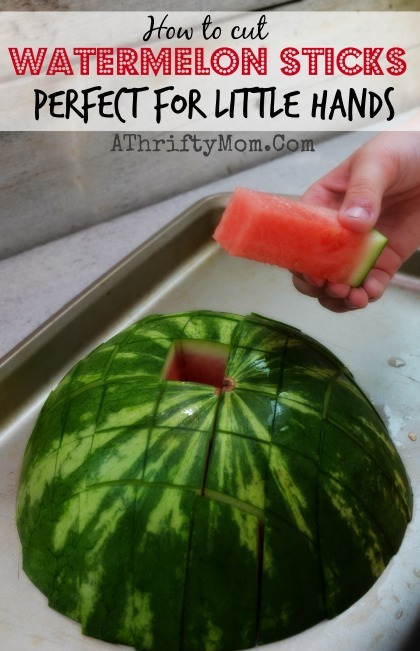 After 3-5 mins, take out of the pot and put in a sink full of ice water. 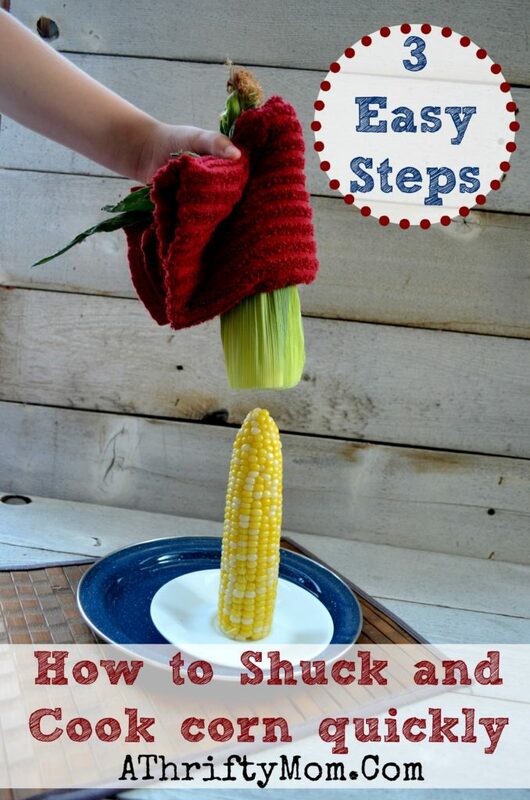 This will cool the corn down and let you handle it better. 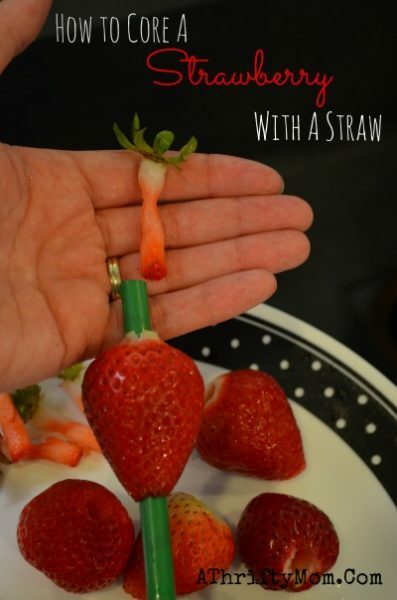 After a few minutes in the ice water, take out and put on a towel to drain the water off. Take your knife and run it down the corn cob and cut all the corn off. 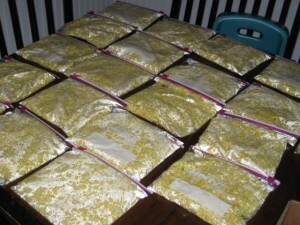 I then take about 2 1/2 cups of corn, and put it into a quart sized freezer bag. Try to get out as much of the air as you can, then seal it closed. They will need to lay flat till they are cooled to room temp. At this point you just need to write the date on it and stack it in your freezer. I was able to get 21 bags of corn. This is one of my families favorites, and we look forward to eating it over the next year! 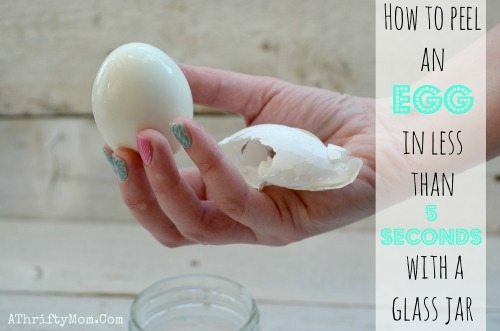 When you get ready to cook it, take it out of the freezer. You can thaw it in the refrigerator the day before, but I do not normally think ahead like that. So I cook it a glass container with a lid on high for 5-7 minutes. I season it with butter, salt and pepper and sometimes a little bbq sauce. Update* Now that my family has grown, I put 4 cups into a gallon freezer bag. This is enough for a side for a larger family. It did take some work, but it was FREE and well worth the time. 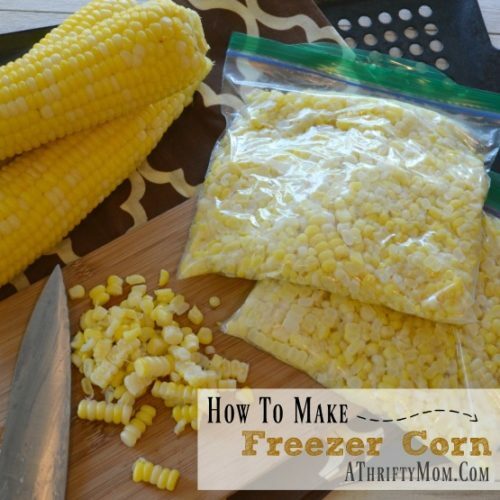 Hope you take the time to try this out, not that you know how to make freezer corn. 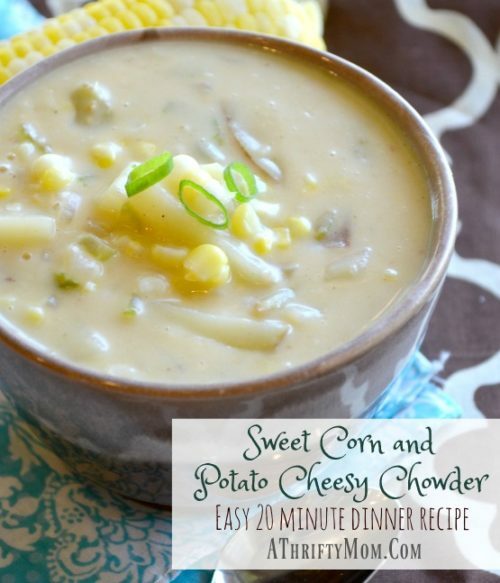 Also make sure you check out our Sweet Corn Cheesy Potato Chowder Recipe – So easy to make, from start to eating in less then 20 mins! A Thrifty Mom thank you so much! She’s right handed, it’s a mirror image. See her wedding ring? If you don’t own a vacuum sealer, you can place the bag in water with a majority of it sealed and water will put enough pressure on the bag to push the air out of the bag. Then you seal the rest of the bag. It’s a great trick! tube pan , same as angel food cake pan. Just did mine a few weeks ago!! Super easy!! Just remember that corn is a grain, not a vegetable. 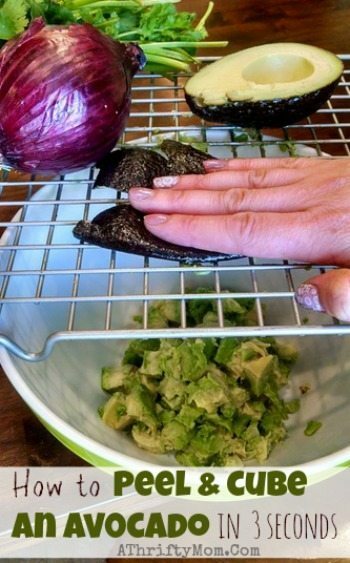 If you serve you still need to serve lots of veggies. 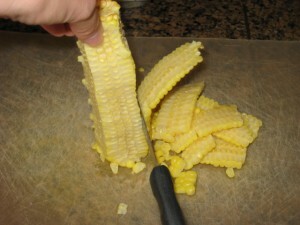 When you use the corn later..how do you prepare it?? A bundt pan works to. Just like we did 60 years ago. Grew up with giant chest freezer. Yummy. 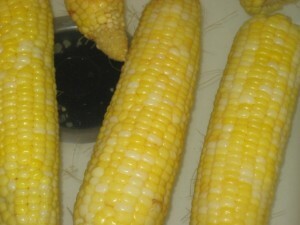 Get a tube pan,stick corn in center hole.It holds corn you cut and kernels go into tube pan. Luv this. Can’t wait to try it. My husband boils it after he cuts it off with butter, salt and pepper. Is it better to do it this way? 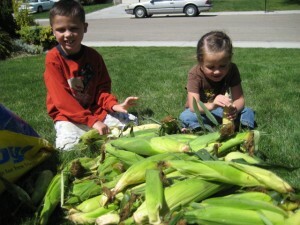 My kids love corn too! How do u keep ur Stainless steel fridge so shiny? Love love corn. It’s only my daughter and I, but I want to do this. I love fresh stuff! 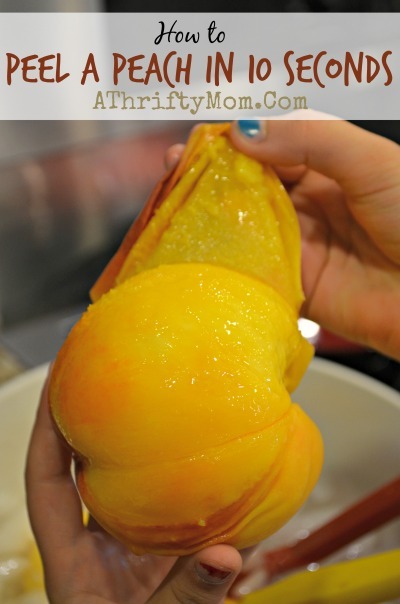 I used to go picking everything from corn to peaches with my family! Happy belated left handers day!! My in-laws are farmers and we get fresh corn. It is the best. I live in Central California. We have tons of veggies! I love our farmers markets here. Love all of your tips. Hope everyone is having a good day! Black Friday sale on Food Storage Freeze Dried food end tonight!